It’s hard to believe that prior to Saturday, Clayton Kershaw had never beaten the Phillies. He has been one of the top pitchers in the National League for the last few years, but the Phillies lineup would get to him. However, this is a different Phillies lineup than in recent years. When a pitcher with an ERA under 2 goes against an offense that’s almost last in the majors in runs scored, the outcome can be easily predicted. Kershaw was perfect through four innings. Everything was working for him as the Phillies didn’t stand a chance. Domonic Brown finally got the Phillies first hit in the fifth inning, but that wasn’t going to stop Kershaw, who dominated all night. The Phillies had their biggest threat in the eighth inning when Kershaw started to tire. They managed to get two men into scoring position, but failed to bring them home. Kershaw struck out Carlos Ruiz to end the inning and the threat. 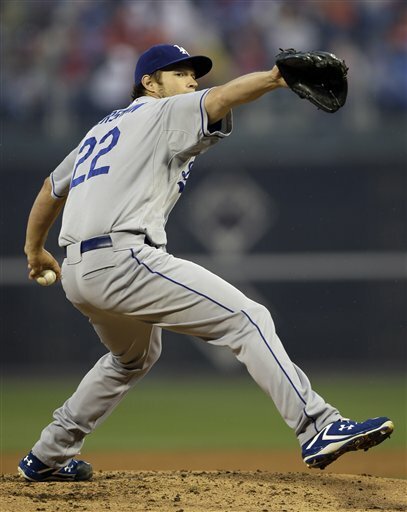 Kershaw shut out the Phillies over eight innings. He allowed just three hits and a walk, while striking out eight. Within ten minutes of the first pitch, the Phillies were down 1-0 with the bases loaded and nobody out. It looked to be an ugly first inning for Kyle Kendrick; however, Andre Ethier grounded into a 1-2-3 double play. A.J. Ellis grounded out to end the inning, as Kendrick escaped the jam with just one run. Kendrick allowed one more run in the fifth inning on an RBI double to his counterpart, Clayton Kershaw. Overall, Kendrick pitched fairly well: six innings, two runs on seven hits, no walks, and a strikeout. Once Kendrick was able to get Ethier to ground into a double play, he really settled down for the rest of the night. The Dodgers broke the game open in the ninth inning when Juan Uribe smashed a three-run bomb, making it 5-0. With the 5-0 win over the Phillies, the Dodgers have won an incredible 42 of their last 50 games. This ties the best streak in over 100 years. Meanwhile, the Phillies have yet to score a run in the Ryne Sandberg era.